LET YOUR HOME BE ATTENTION GRABBING THIS FESTIVE SEASON- Solar strings lights are just what you need to make your home get the attention of admirers this festive season. 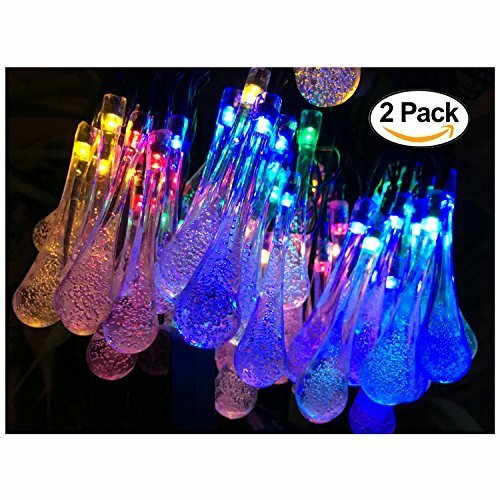 Whether it is for a festive or romantic mood, or just to bring a cheerful feel to your home, these solar string lights are the best pick for you. MAKE NIGHT TIME LOOK LIKE DAY TIME-This string light is solar powered. They will charge during the day and light up your outdoor space at night. You can use hues of white/warm white/blue/multicolor light to beautify your surroundings This solar string lights outdoor have an inbuilt sensor that switches on t at night and switches off the light at dawn. Isn`t that great? OPERATE WITHOUT STRESS-Only two switches of on/off button and bi-mode button are all you need to operate this, solar strings light warm white. You don't need to be tech savvy to be able to operate this solar flood lights. ENVIRONMENTALLY FRIENDLY AND LOW MAINTAINCE COST- The entire unit which includes the mounting spike, solar panel, and led lights on a string is environment-friendly and requires low maintenance. Perfect for inclement weather and you don't need to remove the lights when it rains.